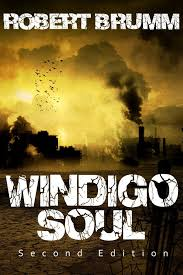 Windigo soul is set in a Dystopian future that's been ravaged by man failings to look after the planet where the air is too polluted to breath without the aid of masks and simple things like water supply are rationed these days. One of the measures put in place by the united federation of nations is to help reduce overcrowding on the planet all citizens are retired at the age of 60, not retired as we know it but euthanized. Hank Reed has just turned 60 and is due to report for his retirement tomorrow but Hank is starting to struggle with the notion of retirement although his wife Peg is also due to retire in a few months Hank isn't comfortable with leaving Peg and his daughter Sara behind in such an unstable time. The day of Hanks retirement comes so hank reports to the governments building as instructed where he is euthanized but it doesn't turn out as expected as Hank awakes in a strange facility only to be told he has been given a second chance that only a very small few people get but it has a price to pay, Hank wouldn't be able to have contact with his family ever again, hank is sent to Windigo a power plant that helps generate power for the region but is a horrifying way that is far from Hanks wildest imagination. John Sanderson hanks son in law has a secret double life where he works for the agency as a cleaner, hank always new that there was something about john he couldn't quiet put his finger on but as long as he made Sara happy he never really pursued what that was. The pair make their way into the woods but it isn't long before the installation authorities are hot on their heels trying ensure the trouble at the compound doesn't become news and highlighting to the world what is actually happening at Windigo. Hank and John are soon captured by a team of freedom fighters led by an old man by the name of James Greyson the leader of the Peoples Liberation Militia and his son Holden who together are already planning an attack on Windigo but is stalling as they didn't have the knowledge of the installation to make it work but now with the help of Hank & John Greyson can lead an attack on Windigo and finally show the rest of the world the true horrors that at take place in the installations. I have had this book on my kindle for some time but never opting to read it but my word how I wish I had read this sometime earlier, Robert Broom’s dystopian tale is thought provoking in the way that we as a society are falling our older generations already and if we let this continue at the same rate we are in danger of following a similar path to the story. Brumm also creates a world that is truly frightening view of how the world could easily turn out if we let it. Not since Cormac McCarthy's "The Road" have I been touched by a fiction book about what possible horrors the future could possibly hold for our children's children's children, this book certainly isn't out of its depth being mentioned in the same breath as "The Road" in my opinion and in the aspect this too could easily be made into a movie providing the roots of this AMAZING story remain.